The term “shark” is used for a handful of Barbs that have torpedo-shaped bodies and large fins, or a few others with a more ‘sinister’ look. But they certainly are not true sharks! In fact, aquarium sharks are either Barbs or catfish. In contrast to their ‘shark’ nickname, Barbs do not even have teeth. Instead, they possess tooth-like structures in their gills called pharyngeal teeth that they use to grind and tear food. Barbs are native to warm, tropical lakes and rivers in Africa and Asia; especially Southeast Asia. 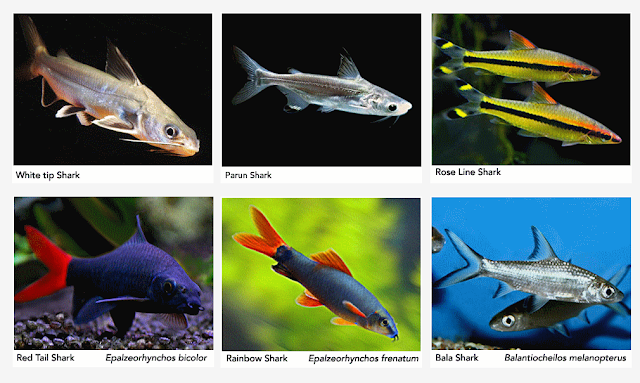 Most species are small and silvery to tan in coloration, although there are many brightly-colored species available to the aquarium hobby. Barbs are attractive to freshwater hobbyists because in captivity they are hardy and easy to care for. To mimic their natural habitat, we suggest that the aquarium be arranged with plants, roots, or rocks to provide hiding places, as well as some open areas for swimming. A shark can be a beautiful addition to any home tank, but be sure to do your homework on them first. Some are very territorial and may attack other fish while other species require a hiding place. Also it is never a good idea to keep more than one type of shark in the tank and this can cause aggressive behaviour in some species. One of the best types of shark is the Bala or Silver Shark. This is a very peaceful ‘shark’ which looks a lot like the real deal. They are compatible with most other fish but they can grow to be very large. In some cases they can reach lengths of up to 12 inches. In order to keep this fish you will do best to have a school of around six of them, which means your tank will need to be at least 350 litres in size. The rainbow shark is quite striking it has a greenish black body with either bright orange or red fins. This fish has to be to a sole purchase as it will become aggressive with other sharks in its territory. On average they grow to around 12-15 cm. Also be sure that the fish you will introduce it to have enough space to hide if it has one of its temper tantrums. A tank of at least 120 litres is recommended for this fish. The red tailed shark is similar in most ways to the rainbow, it body is darker in colour and only the tail fin is coloured but it has the same aggressive tendencies as the rainbow. Another option is the Albino Ruby Shark this one has a cream coloured body with red or orange fins. It is a good community fish and rarely gets aggressive, it can be kept in schools of up to three but if the tank is smaller then only one is recommended. This fish can grow to around 12-15cm or more and you must ensure that you have a cave or log for them to hide in. They are also excellent jumpers so make sure the lid fits well and be prepared when it comes to tank cleaning. There are also sailfin sharks which have larger dorsal fins, they can fight amongst themselves so it is best to keep the as a single fish rather than a school, but in general they are peaceful towards other species. It is, however, not recommended to keep them with small fish as they may eat them. These fish can grow to around 5cm in length. When considering fish for any tank you need to seek expert advice, as factors such as the size of the tank and other occupants will have an impact on what you can and cannot put in. Some fish are fin nippers so having them with other fish that have large fins or tails is a bad idea as they will bully and nibble the fins of the other fish. Similarly you need to understand the maximum size of each type of fish to ensure there is enough room in the aquarium for them to grow and live comfortably. If a fish cannot grow to its natural size and is held back by the room it has, it will most likely die younger and have other issues related to stunted growth. They may only be fish but you need to be aware of their needs and do you upmost to respect and cater for them. These fishes accept most all types of dry and frozen foods commonly used in the freshwater hobby. Because they are omnivores, it is a good idea to provide both meaty and vegetable or algae-based foods. 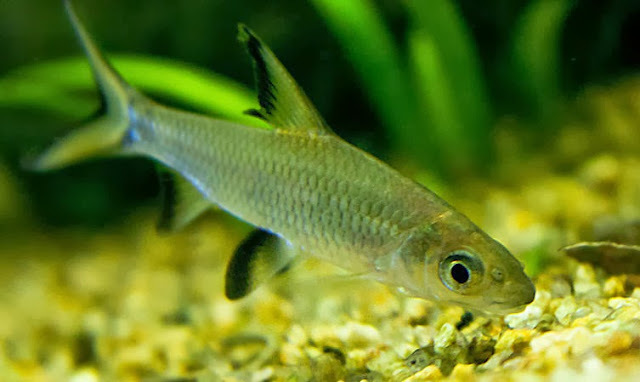 Unlike some species of fish, like guppies, that are able to mate when they are still quite young, sharks does not reach sexual maturity until it is around 4 inches (between 10 and 15 cm), in size. It is very difficult to tell a male from a female shark so it is generally a good idea to purchase five or six of them from the pet store and to observe them for signs of mating behavior. Male sharks tend to grow a little larger than females, and the female is said to have a slightly more rounded abdomen. To make preparations for breeding, set up a separate 55 gallon or larger breeding tank, and keep it at a temperature between 72 and 82 degrees Fahrenheit. Do not crowd the breeding tank with plants but place some around the outside of the tank and a few in the center to provide hiding places for the fish while also allowing for free swimming space.